He has treated athletes from the majority of Barclays Premier League and npower Championship football clubs, as well as football teams throughout Europe and the Middle East, and elite athletes from other sports. 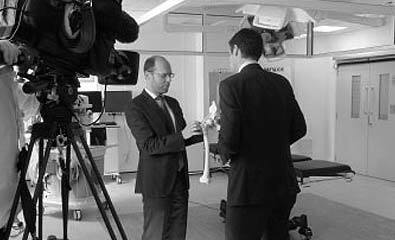 Professor Schilders is the country’s leading expert in adductor problems in athletes. He has unparalleled experience in arthroscopic labral repairs of the hip, having performed in excess of 700 procedures, and has particular expertise in the treatment of femoro-acetabular impingement. At Leeds Metropolitan University, he has been a Visiting Professor in Sports Medicine at the Faculty of Health since 2008 and a Visiting Research Professor at the Carnegie Research Institute of Sport, Physical Activity and Leisure since 2012. Professor Schilders has authored numerous studies on adductor problems in athletes, looking at imaging, conservative management and minimally-invasive surgical treatment. He was the first UK-based author to publish a large study about the advantages of arthroscopic labral reconstruction, as opposed to labral resection in the treatment for femoroacetabular impingement. "Since my operation I have now been playing professionally for 2 and a half years without a single issue and I’m hugely grateful to Dr. Schilders for the work he did for me." " The surgery was totally successful and I am back to intensive training and full competition with no problems." "He is undoubtedly a Top World Surgeon but remains modest, friendly and approachable. I believe that it would be a disaster of huge proportions to the many people suffering from hip impingement problems, if he is not given every assistance for funding and research to continue his important work."